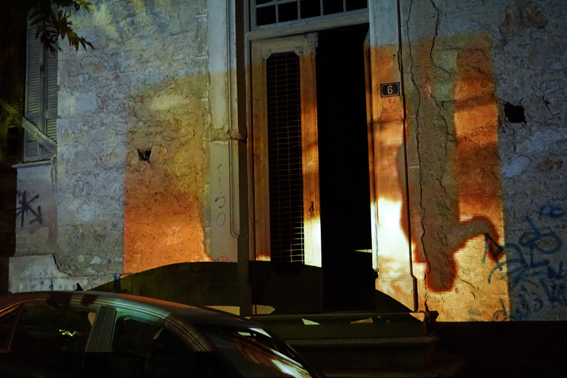 Persistence Obscura: video projection at the facade of the Deserted Building of 6 Neofronos str by the visual artist Rika Krithara. The Deserted House is a small eclecticist house that was donated in the 70s to the Municipality of Kesariani, to become an Infantry station. It remains closed and exists in a state of gradual decomposition. It is located next to the Office. While the Office could be understood as a “personal” ghost, the deserted house is considered as the neighborhood phantom. 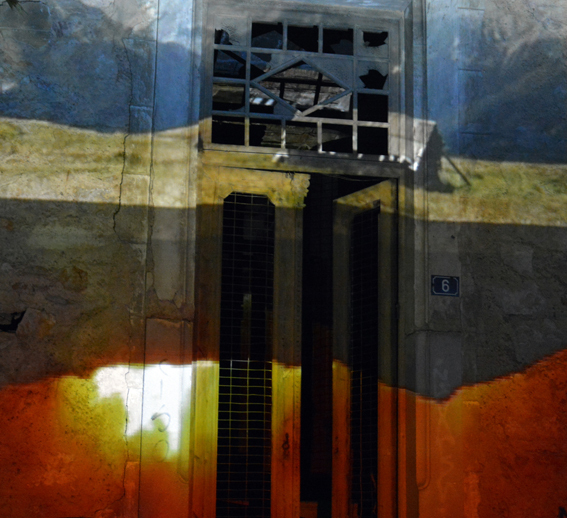 Symbolically Riκa Krithara “illuminates” the dark building with her video projection. On the façade the artist displays simultaneously images from the destruction by fire of mount Hymettos and from the collective life of climbers on the mountain. And symbolically shows us the two sides of the same coin: the lack of love and indifference and simultaneously the mutual aid and respect that sustains us in our daily living. Rika Krithara writes on her work:“There are vast areas, difficult to reach, without clear boundaries, where vision clears. Fragments of organizing living in the mountains, at the end of a day’s wandering. Setting the tent, cooking food in a seemingly inhospitable environment. The minimum of a shell -a tent, a remnant hut- and the small group in an expanding infinite time/ space. Night, gathering around the elementary (food, warmth, sleep), the relation of the unit with the infinite. The fire-mountain, potential annihilation of the possibility of looking at the pure beauty. The improvised organization, the mutual aid, and the Ύβρις of destruction coexist. In the extinguishing effort, images of urban fighting, an “event” fragmentary and disturbing, a rift of perception. The persistence of a foreboding disaster -and its fulfillment- returns as anxiety as well as the awakening of the community. The explosive, unexpected event dissipated in the historical time as a question and a new possibility”.